Have you ever heard, “A hard head makes a soft behind?” Well, I must say, I am all too familiar with this phrase. It simply refers to those individuals who tend to make things hard on themselves by not heeding the warnings of the wise. That was the case when I decided to buy a pricey gold necklace for a young lady I admired in high school. At best, she considered me a friend, but I, however, thought she was pretty special. My mother warned that the necklace was a bad “token of our friendship” idea. But my mind was made up. Bad move! By the time that deal was over, I was so soured on jewelry that my wife, years later, almost didn’t get a wedding band (a little exaggeration, but not much). Yet over the years and with the birth of each child, my love for Jennifer caused me to search for something, something that would express what she truly is to my life. It was then I came across the Character First lesson on sincerity and the attributes of the pearl. Previously, I thought diamonds were by far more superior. But as my sincerity story described the difference between cultured and genuine pearls, I knew I had found my something. Although the cultured pearl comes from an oyster, just like a genuine one, at its core it is really a ready-made glass bead. On the contrary, the genuine pearl is the result of a tiny piece of sand or debris getting trapped in a very sensitive spot when an oyster opens up. And in an effort to ease the pain, the oyster coats the particle with endless amounts of a tear-like liquid called nacre. And over time those many layers of tears form something very precious. That’s my Jennifer! Time and tests only seem to make her shine brighter because her heart is true. But ponder this. God thinks the same about each one of us. 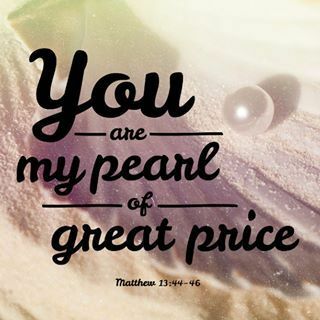 We are His strand of pearls. He paid a premium price for us; the precious blood of His Son, Jesus. And there is nothing in this world that He won’t do for us. So, the least we can do is draw near to Him with a Teachable, Respectful, Undaunted, Eager heart. Having a true heart doesn’t mean you are “mistake-free.” It simply means you are real before God. It means that you are “all in.” No games. And that guarantees you will miss it from time to time. But that’s what sets you apart. Because you love Him enough to continue to pursue, His love will cover your edges and make you true, through and through. I WILL be all that I can be. I WILL take responsibility for my own actions. I WILL respect others’ opinions. I WILL not take advantage of other people. Biblical Meditation: Matthew 13:45 Again, the kingdom of heaven is like a merchant looking for fine pearls. February 4 – Who Are You? Who are you? Not “what do you do for a living” or “how do others view you.” For me, this question is tough to answer, because of the many proverbial hats I tend to wear in life. I am a husband, I am a father, I am a son, I am a brother, I am a witness, I am a friend, I am a citizen, and so on. So to just declare who I am in a single-minded fashion requires some assistance from God. Because he alone truly understands our “who,” His Biblical insight revealed through the likes of John becomes tantamount. In chapter one of John’s gospel account, John the Baptizer’s response to those who grilled him on his identity (John 1:19-22) is quite interesting. His first statement was a confession of who he was NOT! In essence, knowing who you are is as much about knowing who you are not as it is about anything else. He was aware, with what he was doing, some would wonder if he was the Christ or some other great figure promised in the ancient writings of Moses and the Prophets. To all their claims, he said “no,” because he knew that God’s purpose for him was to be “the voice of one crying in the wilderness;” and he was to “make straight the way of the LORD (John 1:23).” And everything he did centered on that one thing. My desire is to know clearly my purpose, my God-given purpose, so well that I don’t deviate toward endeavors that prove counter-productive and confusing. Just because I can do something doesn’t mean God has called me to do that something. It has to fit His divine designation for my life. And if no one else on the planet knows what that is, I must know it like the back of my hand. Then, when they come calling and clawing to put a label on me and a description on what I do, I can set the record straight! Biblical Meditation: 1 Corinthians 2:16 For who has known or understood the mind (the counsels and purposes) of the Lord so as to guide and instruct Him and give Him knowledge? But we have the mind of Christ (the Messiah) and do hold the thoughts (feelings and purposes) of His heart. When it comes to Christianity, I struggle sometimes with the “how comes.” Why are there so many fragmented pieces? Why is there so much duplication and yet, limited unity? And why, if our Savior and Lord came and healed the sick, prospered the poor, fed the hungry, gave sight to the blind, and opened prison doors for the captives, why do we struggle so in doing the same? In all honesty, there are many times I get so caught up in this type of thinking, I lose sight of what God taught me years ago. During a time of “wandering through the why’s,” I asked God for help with some of these questions. And instead of answering me in an audible voice, He led me to the prayerful words of Christ in John 17. There I saw the Lord prophetically praying His will for those who would one day be known as Christians. He knew unity and harmony would be a feat that only His Father could muster. There would be so many from different walks of life, with so many mindsets. That is why it is a sign of maturity when we choose to pray as Christ did for the Body of believers instead of critiquing and criticizing its shortcomings. This morning I was moved by the thought of this great Body, more than a billion strong world-wide, united through prayer and harmoniously representing Christ in its manifold languages and flavors! There is nothing like it in the entire universe! So I commit once again to pray for her and play my role. And may the world feel the weight of Christ’s love for them through our obedience. Biblical Meditation: Psalm 2:8 Ask of Me, and I will give You the nations as Your inheritance, and the uttermost parts of the earth as Your possession. I’ve often thought how wonderful it must have been to be alive when the Son of God walked the earth. It seems like it would have been a lot easier to believe in Him. In my mind, I also tend to think surely everyone must have been completely enraptured by His mighty works. Surely they knew this was indeed the Son of God! However, the Bible gives a number of accounts that don’t validate my mental ideologies. One such instance occurs around the feeding of five thousand men and their families (John 6). After Christ transformed two tiny fish and five small barley loaves into a massive smorgasbord, the crowd was set on making him king. But in less than 24 hours, many of that same bunch turned their backs on Him. His words were too heavy for them. Besides, in all reality, they were more interested in the miracles than the message anyway. Thankfully, this was not the case with everyone. While people were leaving in droves, The Lord turned to His inner-circle disciples and asked if they wished to leave also. He and those who chose to stay that day didn’t allow their limited understanding to keep them from standing under the grace and truth residing in His words. I estimate our day is no different. Though Christ is not present in physical form, His message and ministry still lives on. And to those who dare to believe, His glory is as visible as it was to those who walked with Him in the days of old. The decision just has to be made to hold fast to His Word that is never-ending…instead of looking for His wonders that are often here today and gone tomorrow! Biblical Meditation: Isaiah 26:3 You will keep in perfect peace him whose mind is steadfast, because he trusts in you. Little babies provoke people into grabbing them, even if it’s a child they don’t know. When we had our first child, I really had a tough time with the ‘grabbers.’ I was not very fond of sharing my baby! I can only imagine what Mary and Joseph were going through when Simeon takes their baby out of their arms and begins to walk around with him! Even if he was saying a blessing over the boy, this still must have been a little bit hard to swallow. If that wasn’t strange enough, a little lady in her nineties starts throwing her hands up and praising God, all the while telling everyone their child is going to ‘set them free!’ Now granted, with the angel visits and the sheepherders’ arrival, Mary and Joseph were probably not too taken aback. However, I don’t care who you are, these people were a little strange! Take Anna, the ninety-one year old praising widow. For eighty-four years, she lived in the temple, night and day. That’s like camping out in one of the local congregations 24/7. Not only that, but she was apparently known as a prophetess, and if you know anything about the Old Testament prophets like Samuel and Elijah, you can imagine her conversations were not “light and fluffy!” All of this, coupled with the fact that her diet consisted primarily of fasting and prayer. Nonetheless, this strange woman’s story is highlighted in the best-selling book ever written. And not only that, for all of us who know that baby as Jesus, the Lord and Master of our souls, she is a witness. This Anna brings to light one of my favorite definitions of the word “strange.” In Webster’s 1828 Dictionary, “strange” can mean “foreign; belonging to another country.” So what does that tell you? Maybe all of us should “deluge” ourselves with the Master and His ways until others think we are from another planet! Seriously, stop right now and thank God for all those strange people you’ve passed off as crazy, or just a little annoying. Who knows, God may have them on a special assignment to change your life. I will share a couple of incidents, but no names. The pain is too real and the problem is far too prevalent. He and his little sister had free and reduced lunches at school. But on the weekend, food was scarce around the house. One Saturday afternoon, he decided to take a loaf of bread and package of wieners from the local grocery store. Too young to be inconspicuous, a veteran cashier caught him sneaking out the front door and alerted her boss. When they got him back in the store, it became apparent he was “one of those kids.” He was banned from the store and labeled a troublemaker…and he and his sister went another day with empty tummies. . . . Her daddy took a job in a new town. She left her old friends and was hopeful that she’d make some new ones at her new school. The town was small and everybody had pretty much grown up together. The first day she arrived, not one girl seemed to notice. She made every effort to get acquainted, but all her advances were met with resistance. Two years later, she graduated and as far as she knows, no one at the new school remembers her name. That was twenty years ago and the memory still stings. There are people all around us that need someone to care enough to look beyond their immediate existence and reach out on behalf of another. I was one of those people at one time in my life and fortunately, there was “somebody” who cared. But it is far too common to hear things like “let Washington pay for it. That’s why we pay taxes, anyway!” What a shame. God expects more out of His children. We are our brother and sister’s keeper. When they hurt, we hurt. And if they hunger, we too are malnourished as a culture. So. Don’t wait for Washington. I once worked at a restaurant. It was a fairly nice establishment…classy plates, linen napkins, fine wine and such. One night the power went out from an unexpected lightning strike. And it was a Friday night! We weren’t out of electricity that long, but notice, I did. I noticed the fussy fusses were afraid of the dark. I noticed the worker bees were somehow not so much. I noticed the smarty pants didn’t seem all that smart in the dark. I noticed the simpletons were in high demand…pretty smart after all. And I noticed how much we resemble one another when the lights are off. Today, from time to time, I hear talk about the weather, the water and the way the world turns. And I think to myself, “Enjoy the luxury of logic and litigation while the power is on.” Because when He who knows decides it’s time for an “unexpected interruption,” chances are, He won’t be calling you or me ahead of time. Think I will just consult Him…on a regular basis. On His terms.